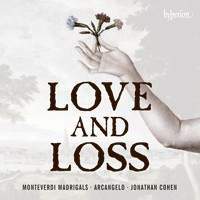 The latest disc from Jonathan Cohen’s virtuoso ensemble Arcangelo is a musical love story, complete with lovers’ quarrel (a sword-battle to the death, no less), tearful partings and tragic endings. Bringing together the Sestinas from Books 6-8 of Monteverdi’s madrigals, the programme explores the gamut of the composer’s mature style, evolving from the crystallised prima prattica perfection of Book 6 to the genere concitato (‘agitated style’) of Book 8. All of Cohen’s singers come from the world of opera, and it shows in performances that place the drama of le parole to the fore. The astonishing harmonic flexibility and melodic narrative of Monteverdi’s writing translates here into urgent drama. You can’t turn away from the musical convulsions of Clorinda’s death (Combattimento di Tancredi e Clorinda, Book 8), nor doubt the simple agony of the lover in Book 6’s Sestina Lagrime d’amante al sepolcro dell’amata. If occasionally voices over-exert, strive a little too earnestly to make their case (tenors and sopranos both push hard through the chorus ‘Ei l’armi cinse’ from Volgendo il ciel) then it seems a fair trade for so vivid an aural staging. But among so much vocal athleticism, it’s still the instrumentalists of the ensemble that dominate, setting the disc apart from the excellent I Fagiolini recordings that come closest vocally to this kind of abandon. Sitting midway between the nervous energy of Alessandrini’s Concerto Italiano and the more measured intensity of Jordi Savall for the Book 8 works, Arcangelo’s musicians deploy rough-edged expressive risk-taking within a framework of complete stylistic control. The result is so exciting that Merula’s throwaway Ciaccona for violins and continuo – all quasi-improvisatory brilliance and fire – risks being the best thing here.